Wild Alaska salmon has long been the leviathan when it comes to grabbing attention as our state’s tasty finfish. But in our cold northern waters, others also thrive, and two MBA students at UAA are guiding them to market. The students are Kelly Harrell, 32, and Peter Arlein, 28, both full-time professionals navigating graduate school courses on nights and weekends at UAA. Each is about two-thirds of the way through their program. In April, they launched Kodiak Jig Seafoods, a social enterprise linking Kodiak’s Pacific cod and rockfish catchers with Anchorage consumers, fish markets and restaurateurs. Harrell is the executive director of Alaska Marine Conservation Council, a nonprofit that since 1994 has advocated for healthy fish and healthy coastal communities able to sustain their fishermen. Arlein works for a public relations firm supporting the Alaska Seafood Marketing Institute. The two met in class at UAA, and when Harrell was ready to promote the jig-caught seafood, she tapped Arlein to help with promotion. AMCC’s endeavor is in collaboration with the Alaska Jig Association, representing local fishermen who harvest from small boats with hook and line. 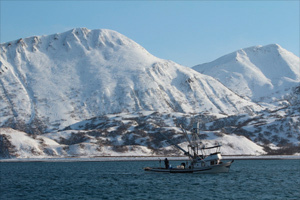 Formed in 2004, it advocates for entry-level opportunities in Alaska fisheries, and is part of a nationwide network of community-based fishing organizations. Financial support to launch the jig-caught marketing campaign came from a $90,000 National Fish and Wildlife Foundation grant in 2012. AMCC used part of the money to host seminars for fishermen on how to take better care of the fish they caught so they could deliver higher quality and command a better price. Harrell says the goal is to get fishermen 40 percent to 100 percent more for their catch through the program. Entry barriers into the fishery are low, Harrell said. Licenses to jig cost $75. “Essentially, if you have a boat, some bait and some hooks, you can go catch fish,” she said. The jig-caught seafood campaign is a second chapter in AMCC’s Catch of the Season program, which also has the goal of linking locally caught seafood with Alaska consumers. Past efforts included three cycles of bringing short-season Tanner crab to consumers through customer pre-orders in Kodiak, Anchorage and even Homer. In a 2012 article Harrell wrote for the National Fisherman, she celebrated the success of the Tanner crab campaign, noting that Holland America/Princess purchased 8,000 pounds that year for their five Alaska lodges. That connection proved significant. Philippe Janicka works as beverage operations manager at Holland America/Princess. When AMCC offered some rockfish and Pacific cod for him to try this year, he brought it home to his wife to prepare. She just happens to be Natalie Janicka, executive chef for Bear Tooth Grill. The chef whipped some up for their dinner, and declared she was sold. The difference, she says, comes from the way fish are handled when harvested. She followed up with her bosses, and by late April, Bear Tooth was offering a Kodiak black rockfish special through Kodiak Jig Seafoods. They plan to roll the jig-caught Pacific cod into their menu year-round. Janicka said they’ll prepare it broiled, blackened and fried, in fish and chips and in a summer ceviche dish. Holland America/Princess, The Natural Pantry grocery store and Alyeska Resort’s Seven Glaciers Restaurant all signed on to feature either the jig-caught rockfish or Pacific cod. Landing in Alaska to advocate for community-based fisheries was a natural for Harrell. She grew up fishing, crabbing and boating in coastal Virginia. Part of her family comes from a small fishing community on the Outer Banks of North Carolina, so she grew up understanding coastal communities and the value of local fishing opportunities. That background led her to graduate school in fisheries policy at the University of British Columbia, where a summer internship opportunity with the AMCC caught her eye. In 2005, she worked for the nonprofit on Bristol Bay issues, and knew immediately that Alaska could satisfy her passion and values for supporting local fisheries. She’s been with AMCC since, eventually becoming its executive director. Arlein’s journey to Alaska was more adventure-based. He came out of Colby College with a degree in neuroscience, bound for medical school. But ski and sailing adventures in Colorado, California, Mexico and eventually Alaska gradually drew him north. He worked a summer as a deckhand aboard a salmon seiner out of Kodiak before starting his MBA. His emphasis is business intelligence and data analysis “to satisfy the scientist in me,” he said. Kathleen McCoy works at UAA where she highlights campus life through social and online media.